Research has found that city-dwellers can benefit mentally and physically from as few as five minutes in a forest or a green space. Yet, in many urban parts of the United States, access to such areas is limited. Residents who want to escape the roar of traffic and the oppressive gray of concrete high-rises do not necessarily have the opportunity to do so. Experiencing the outdoors in some cities requires a long drive, an expensive proposition for families working to pay down their mortgage or credit card bills. Read the 2016 version of our study on the best cities for outdoor enthusiasts. Not all cities are equal in this regard. Some maintain green spaces within city limits in the form of public parks, wildlife refuges and nature preserves. For those who love the outdoors, these cities present an opportunity to have it both ways: to live in an urban area while enjoying fresh air, greenery and an active lifestyle. To find the best cities for outdoor enthusiasts, SmartAsset gathered data reflective of the access to green spaces and the quality of the natural environment in America’s largest 100 cities. We wanted to find places where it is easy to spend lots of time in the outdoors and immersed in nature. Escape the lower 48. The top two cities for outdoor enthusiasts are located in the country’s two most isolated states, Hawaii and Alaska. 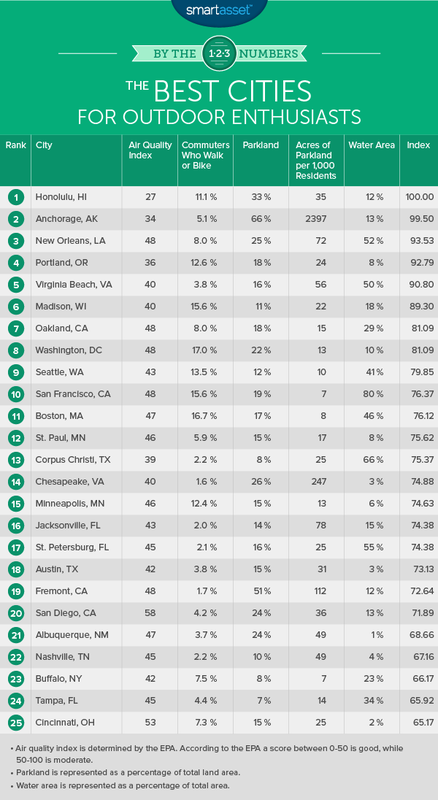 Honolulu and Anchorage ranked first and second, respectively. If you’re thinking about relocating, however, keep in mind that both Hawaii and Alaska have a fairly high cost of living. The Pacific Northwest rates well. The PNW has some of the country’s most breathtaking landscape, boasting such national treasures as Mount Rainier National Park and Cannon Beach. The cities reflect the surroundings. 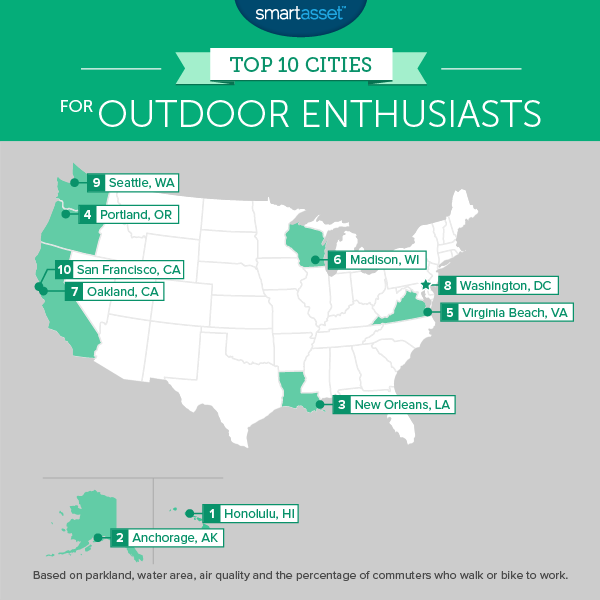 Portland and Seattle rated as the fourth and ninth best cities for outdoor enthusiasts. Staying indoors in the Southwest. The bottom of the list was dominated by southwestern cities like Las Vegas, Mesa and Fresno. These areas have mediocre air quality and precious few parks. Almost nobody in the southwest bikes or walks to work, a result, perhaps, of the hot climate. Buying a home? Find mortgage rates here. The first image Honolulu evokes is likely that of a white-sand beach lined with lounge chairs and umbrellas. It certainly has plenty of that, but with more than 12,000 acres of parkland it has a lot more to offer those who love the outdoors. Just minutes from downtown Honolulu is Puʻu ʻUalakaʻa State Wayside, a forested hillside park with views of the city and Pearl Harbor. 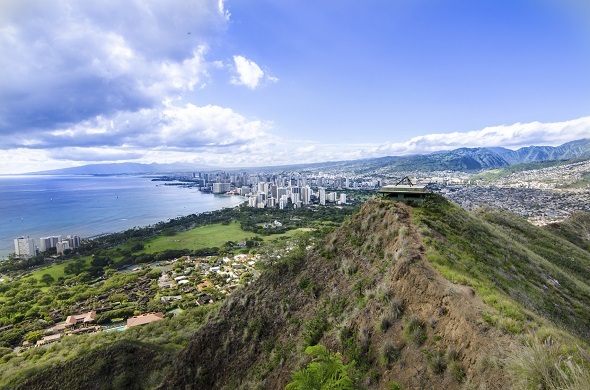 Diamond Head State Monument is the city’s most recognizable natural feature and a popular choice for hikers. Find out now: What does it cost to retire in Hawaii? Honolulu also has the cleanest air of any major U.S. city, with an average EPA air quality index rating of just 27. The air quality index reflects the amount of particulate matter, ozone and other pollutants in the air. Lower is better and a score between 0-50 is considered good by the EPA. The largest city in the Last Frontier, Anchorage sits at the edge of America’s most pristine wilderness. Even without considering the proximity of areas such as Denali National Park, which is a four hour drive from downtown, Anchorage rates as a top location for enjoying the outdoors. Anchorage has by far the highest park acreage of any major city, with over 700,000 acres of parkland within city limits. Much of that is contained within Chugach State Park, a nearly 500,000 acre park that circles around the eastern edge of the city and offers hiking, camping, fishing and other outdoor activities. The Big Easy is home to the country’s largest urban wildlife refuge, the 24,293 acre Bayou Sauvage National Wildlife Refuge. The refuge provides temporary or permanent habitat to a number of notable bird species, including the brown pelican and the bald eagle. In addition to the wildlife refuge, a number of small municipal parks, including New Orleans City Park, help give the city the 5th highest parkland percentage of any city in the U.S. Over 25% of the land area of New Orleans is parkland. In the shadow of Mount Hood, Portland is replete with green spaces and natural beauty. Forest Park, which covers a 5,172 acre patch of hillside above the Willamette River, is the seventh largest municipal park in the country. Portland is also known as a particularly friendly place for bikers. 7.2% of the city’s workforce commutes by bicycle, the highest percentage of any city in the U.S. The Chesapeake Bay is the nation’s largest estuary and an extremely complex ecosystem, home to more than 3,600 plant and animal species according to the National Wildlife Federation. Virginia Beach sits at the mouth of that ecosystem, making it an ideal big city for boaters, bird-watchers and anyone who loves the open water. It is also home to the Back Bay National Wildlife Refuge, a 9,000 acre fresh water refuge that is a key resting place for many species of migratory bird. According to the U.S. Census Bureau, 15.6% of Madison’s workforce either walks or bikes to work. That is the third highest outdoor-commuting percentage of any major U.S. city. Walk Score, which calculates a 0-100 score for major cities based on the convenience of walking, biking and public transportation, rates the city as “very bikeable.” It’s bike score of 73 higher even than that of Portland, Oregon. Of Oakland’s 6,000 acres of parks, 84% is classified as natural parkland (as opposed to designed parkland). That means it is essentially left undisturbed and maintained as a natural environment. Take, for example, Redwood Regional Park, which is home to the largest stand of coast redwood in the East Bay region. Another reason Oakland may be attractive to many outdoor enthusiasts? The climate. Average highs in the Oakland area range from 58 in January to 74 in September, perfect for those who love the outdoors but not extreme temperatures. The nation’s capital ranks first in the country for the percentage of its workforce that walks or bikes to work, with 17% of DC residents commuting primarily through one of these modes. One reason for that high rate of fresh-air commuting is likely infrastructure investment: the District has added more than 60 miles of bike lanes in recent years. The birthplace of REI, Seattle has long been a mecca of sorts for those who love the outdoors. It is surrounded by lush forests and mountain ranges in areas such as Olympic National Park and the Mount Baker-Snoqualmie National Forest. You don’t need to leave the city to experience nature in Seattle, however. Within city limits there are a number of parks that feel nearly as wild as a national forest. Local favorites include Discovery Park in the Magnolia neighborhood and Washington Park Arboretum, which is located along Lake Washington south of the University District. The total land area of San Francisco is just 30,000 acres, smaller than the entire park systems of many cities on this list. Thus, its total parkland of 5,700 acres constitutes a fairly high percentage of total area, almost 20%. Furthermore, there are a number of green spaces just beyond city limits that are perfect for an afternoon escape. Perhaps the most convenient is Golden Gate National Recreation area, which sits across the Golden Gate Bridge from the city. Parkland as a percentage of total land area. Acres of parkland per resident. Water area as a percentage of total area. EPA average air quality index. Percentage of commuters who walk or bike to work. We ranked each city according to those five metrics. We then averaged those rankings, giving equal weight to each metric. Finally, we applied a score from 0 to 100 based on those averages. The city with the best overall average received a 100. Data on each city’s parkland comes from the Center for City Park Excellence at the Trust for Public Land. Data on water area comes from Wikipedia. Data on the percentage of commuters who walk or bike to work comes from the U.S. Census Bureau. Data on the average air quality index comes from the EPA. Read the 2016 version of this study.